Text: Norma J. Martinez / Research: Norma J. Martinez, Claus Nordahl, Louise Maria Skotte Møller og Mille Marie Schaufuss/ Photo: S. Rahman/ Graphics: Peter Larsen, Politiken. Danwatch is once again able to document that another Maersk ship is being scrapped at a dangerous shipyard, this time in Bangladesh, where conditions are much worse than in India. Torch cutters work in bare feet and without protection from dangerous gasses. Maersk denies responsibility, but admits to Danwatch that it has failed. The shipyard workers at Janata Steel in Chittagong in southeast Bangladesh prepare to cut up the decommissioned Maersk ship Producer, which after thirty-two years of service in the North Sea has been sold for scrap. 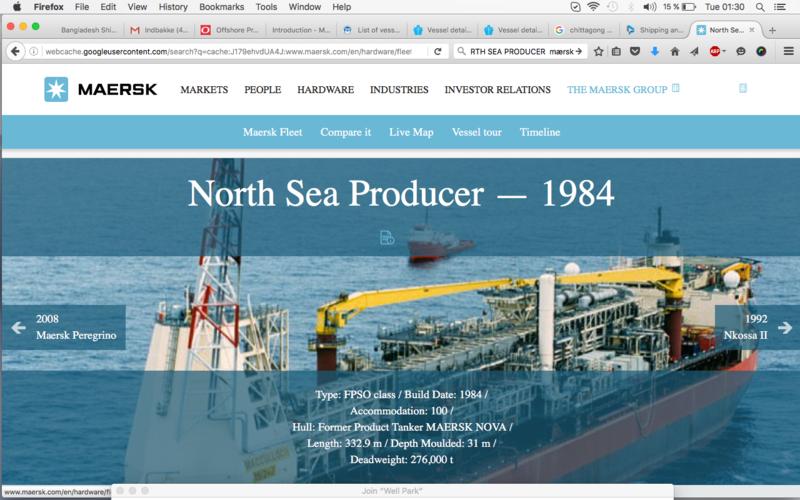 The Producer is a so-called floating storage, production and offloading (FSPO) unit that has carried oil in the North Sea since 1984, and has been owned and operated by Maersk under a variety of business configurations. It was originally built in 1984 as an oil tanker with the name Maersk Dagmar at the Lindø Shipyard in Odense. In 1997, it changed its name to the North Sea Producer and its function to an FPSO unit, a floating production and storage facility. As it did so, the ship’s operational responsibility was transferred to a firm called the North Sea Production Company, which was owned in equal parts by Maersk and an international firm called Odebrecht. The Producer is 332.9 m. long, which is roughly equivalent to three football fields. The ship weighs 276,000 tons, equivalent to 500 Airbus 380, the world’s largest airliner. In its time as a floating oil platform the ship could produce up to 76,000 barrels of oil each day and had a total capacity of 560,000 barrels of oil. Producer operated at sea depth of 147 meters. Producer space for a crew of 73 man. North Sea Production Company Limited sold the North Sea Producer in April 2016. In August 2016, the ship was sold for scrap to Janata Steel in Bangladesh for nearly 45 million of by GMS, the world’s largest cash-buyer for ships for scrap. In connection with the sale, the ship changed name to Producer. The vessel was sold as a ‘dead vessel’ and pulled by a tug from England to Bangladesh, where it is now being scrapped. Shipbreaking has been called one of the world’s most dangerous by the International Labour Organisation, an arm of the United Nations. Last week, Danwatch documented how Maersk is currently scrapping two ships at a hazardous shipbreaking yard at Alang beach in India, a practice that is expected to earn the company $150 million over the next five years. In this investigation Danwatch in collaboration with daily newspaper Politiken and broadcaster TV 2 showed that Maersk has another ship at a far more dangerous shipyard in Bangladesh that experts and professionals have called the one of the world’s worst place to dismantle ships. Maersk has for several years distanced themselves from the shipbreaking industry in Bangladesh. According to the international workers union IndstriAll the shipbreaking yards in Bangladesh are ten years from achieving the same standards as the yard in Alang, India, where two Maersk ships are currently being scrapped. Seventeen workers have lost their lives at the Chittagong shipbreaking yards in Bangladesh this year alone. Unskilled shipyard workers at Janata Steel are getting ready to break the Maersk ship Producer. They will use torch cutters to break ships into pieces in bare feet while lacking even the most basic necessary protective equipment like shoes, helmets, and respirators to protect them from deadly accidents and potentially deadly gasses, asbestos, and radiation. But the ship is no longer Maersk’s responsibility, she says, assigning blame instead to the middleman who bought the ship from Maersk and sent it to be scrapped at Janata Steel. Maersk may not be liable according to the law, but it is responsible according to international conventions and guidelines, says Poul Hauch Fenger, a lawyer with long experience in Danish and international criminal and human rights cases at the United Nations and the European Union. “It’s just so unbelievably convenient in business situations to be able to transfer liability to an intermediary. But Maersk has a responsibility to respect workers’ rights and the environment in every link of their supply chain. That’s all there is to it,” says Fenger. Maersk also admitted to Danwatch that the company neglected its obligations with respect to the UN’s Guiding Principles in this case. Maersk was founded in 1904 and has its global headquarters in Copenhagen. Maersk owns and operates 605 vessels. The company’s annual revenue in 2015 was $40 billion. Maersk’s fleet is currently valued at $12.8 billion. For comparison, the value of all Danish shipping put together is $21.4 billion. The company operates in over 130 countries and employs approximately 88,000 people. Danwatch visited the Janata Steel shipyard at the end of August, one day after the Producer was sailed onto the beach at Chittagong. Danwatch took video recordings from the shipyard, interviewed fourteen shipyard workers, and presented the working conditions thus documented to a series of experts to obtain their professional evaluation of the circumstances at Janata Steel. One of these experts was former director of oversight and lead consultant at the Danish Working Environment Authority Hasse Mortensen, who has years of experience inspecting shipyards. With its serious breaches of regulations governing responsible shipbreaking and workers’ rights, along with improper handling of hazardous waste, the shipyards at Chittagong are among the most dangerous in the world, according to experts and advocacy organisations. There are no official records of work-related accidents and deaths among shipyard workers in Chittagong, but the international labour union IndustriAll and the advocacy organisation Shipbreaking Platform estimate that there are more than 20 serious accidents per year at the shipyards. So far in 2016, Shipbreaking Platform has recorded 18 accidents, in which 17 shipyard workers lost their lives on the job. One of the fatal accidents occurred in February of this year at Janata Steel, where the Maersk Producer is now being scrapped. 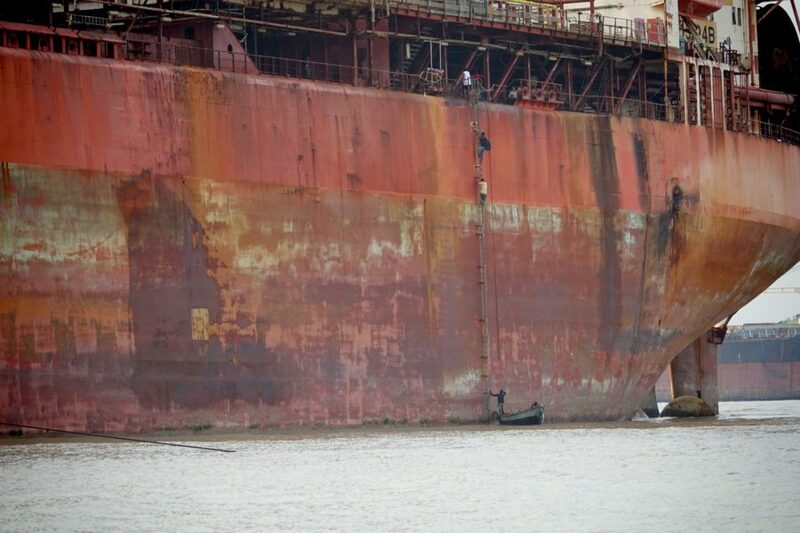 One worker died in the accident, according to Shipbreaking Platform’s accident tally. Working conditions at Janata Steel are not only dangerous, they contravene national and international law. Shipyard workers at Janata Steel like those Danwatch interviewed work 10-12 hours a day, six days a week, for a wage of about $4.50-7.50 per day. None of the fourteen workers interviewed by Danwatch for this investigation had a contract, health insurance, or the right to a day off with pay. Few days after the Producer is beached at Chittagong, Maersk wrote to Danwatch in an email that the company regretted that the Producer was being scrapped in Bangladesh. At the same time, Maersk said that it had placed requirements for responsible ship recycling on the intermediary who bought the ship and sold it for scrap to Janata Steel. The Hong Kong Convention is a global agreement adopted by the United Nations’ International Maritime Organisation. Its purpose is to ensure that shipbreaking does not entail unnecessary risks to people or the environment. 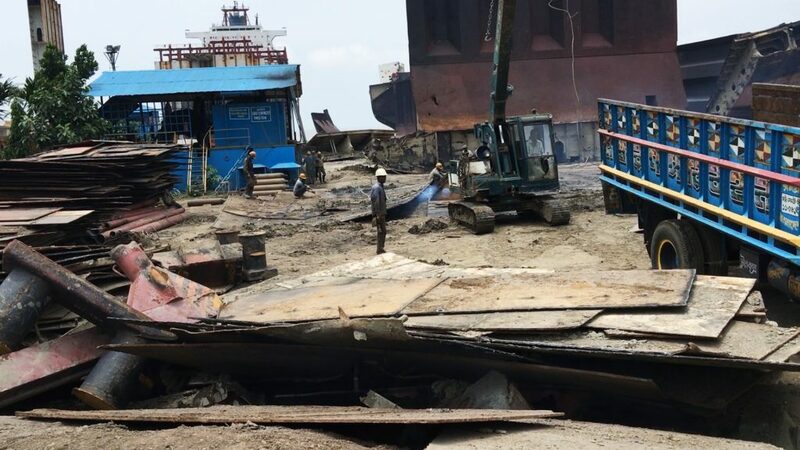 According to several experts that Danwatch spoke with, none of the approximately eighty shipbreaking yards in Chittagong currently meets the requirements of the Hong Kong Convention. Kanu Jain is a maritime engineer at Delft University of Technology in Holland, where he studies shipbreaking. He is well acquainted with the Hong Kong Convention, and reviewed Danwatch’s video and photo documentation from Janata Steel. 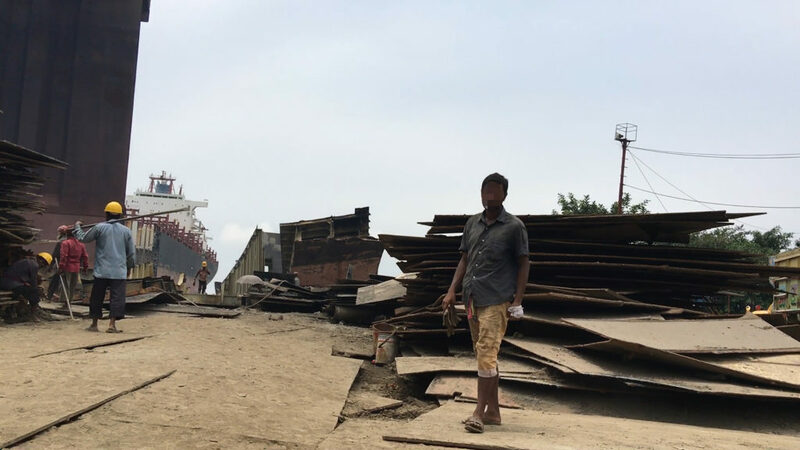 At the Chittagong office of the country’s Department of Inspection for Factories and Establishments (DIFE), a senior director who asked to remain anonymous is also mystified by the idea that the shipbreaking yard meets the standards of the convention. “No shipyard in Chittagong is 100 percent compliant with national laws. Even the few good shipyards in Chittagong fail to fully abide by applicable national laws or the Hong Kong Convention’s requirements,” he says. Susan Wingfield is a Programme Officer at the United Nations Environmental Programme (UNEP) Secretariat of the Basel, Rotterdam and Stockholm Conventions: the global agreements on chemicals and waste. She has been involved with the shipbreaking industry in South Asia for over 10 years, and has made numerous field trips to Bangladesh. Wingfield co-authored the 2010 World Bank report, “The shipbreaking and Recycling Industry in Bangladesh and Pakistan,” which looked at the economic and environmental realities of the shipbreaking industry in these countries. Six years after that report, in Wingfield’s judgment the Chittagong shipyards in general still fail to live up to the requirements of the Hong Kong Convention. 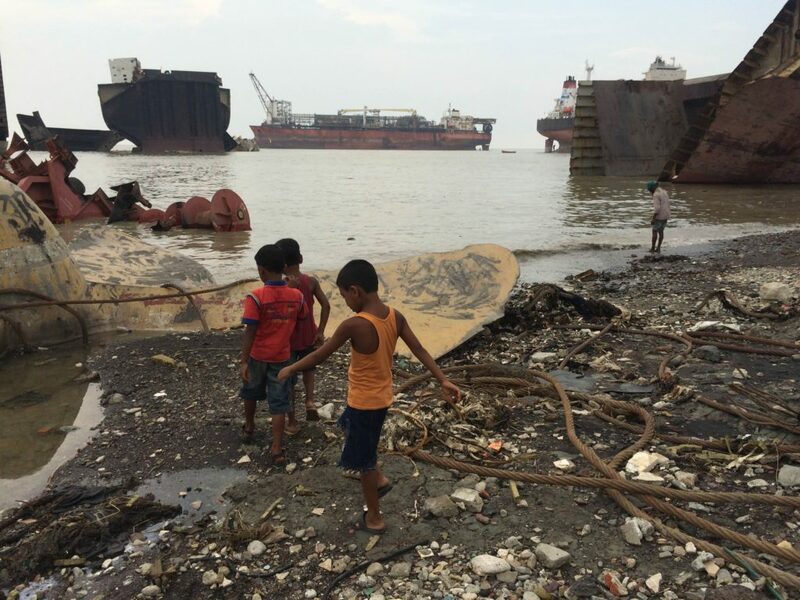 “Without suitable downstream infrastructure for the disposal of hazardous wastes from shipbreaking activities, yards in Chittagong could not meet the standards of the Hong Kong Convention, in spite of any improvements made on site”, she contends. Such infrastructure for the disposal of hazardous wastes is yet to be developed in Bangladesh. She declined to comment on Maersk’s business practices or the specific shipyard in question. The official at DIFE and Susan Wingfield both explain that a few individual shipbreaking yards have taken steps forward in recent years. Janata Steel is not one of the yards they single out as improving their practices. “In my professional opinion, none of the shipyards in Chittagong is in compliance with the Hong Kong Convention,” says Wingfield. She explains that a key requirement of the Convention is the presence of disposal systems for hazardous waste like asbestos, chemicals and oil. “There is no system for this in Chittagong or in Bangladesh generally, so even if a shipyard has a facility to store hazardous waste, that is insufficient, since there is no way to dispose of it responsibly,” she explains. The assessments of these experts were confirmed by the Bangladeshi Ministry of Industries. In February of this year, the Ministry’s joint secretary, Yasmin Sultana, participated in a London conference on shipbreaking together with Mohammed Zahirul Islam, a representative of the Bangladesh Ship Breakers Association. During the conference, both representatives declared that Bangladesh was not yet ready to ratify the Hong Kong Convention, since the country’s shipbreaking yards do not currently meet its requirements. Islam estimated that it would take five years and a multi-billion-dollar investment to bring the country’s shipbreaking industry into compliance with the Convention. There are about eighty active shipbreaking yards in Chittagong, and they are known for being among the most dangerous and most polluting shipyards in the industry. In Bangladesh, the ships are sailed onto the beach at top speed until they are grounded, and then they are broken up by hand on the beach itself, with only limited mechanical help. This shipbreaking practice is called “beaching”, and it has been criticised for years by experts, environmental organisations, and even Maersk itself. “People in-flip flops on beaches are OK. But people on beaches wearing flip-flops and no safety gear while taking apart massive cargo ships with hand tools is simply wrong,” wrote Jacob Sterling, Maersk’s former director of sustainability, in a 2013 blog post expressing the company’s opinion of beaching in Bangladesh. When a ship is grounded on a beach, a large quantity of its toxic hull paint is scraped off the bottom and washed out into the ocean ecosystem. Then the ship is gradually cut into smaller pieces with the help of torch cutting, an extreme high-temperature process that cuts through steel with pure oxygen. To cut a ship’s hull into smaller pieces, the “gravity method” is used, which means that pieces are allowed to fall directly onto the beach. Beaching can also lead to large emissions of dangerous gasses, chemicals, oil, asbestos, etc. Several sources in this investigation preferred to remain anonymous. In addition, in the interest of their safety, Danwatch changed the names of the shipyard workers. The real names of all our sources are known to Danwatch. 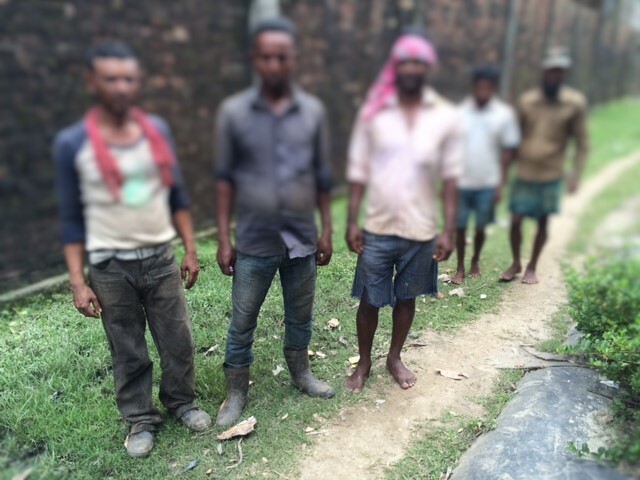 The documentation Danwatch collected on its visit to Janata Steel shows unskilled workers at the shipyard barefoot or in sandals, and while most workers are wearing helmets, most of those Danwatch saw using torches do not wear respirators. According to Abdullah Anwar, this is because they must buy the masks themselves. “The shipyard says that we are responsible for buying our own protective equipment. They have a few helmets and boots available, but we have to buy most of it,” he says. The other thirteen workers interviewed by Danwatch at Janata Steel say the same. At the Department of Inspection for Factories and Establishments in Chittagong, the shipyard’s requirements of their workers do not come as a surprise. “My inspectors see the same problem. It is a violation of Bangladeshi labour laws, which require employers to equip their workers with the personal protective equipment appropriate to the job,” says the DIFE official. “Shipbreaking is a dangerous industry. In principle, no one without safety equipment like safety shoes and helmets should even be allowed to come through the door of a shipyard,” he said. Abdullah Anwar and his colleague Ali Hassan both use torch cutters at Janata Steel. Hassan wears rubber boots and long pants, while Anwar has bare feet and ragged pants that reach only to his knees. But his lack of shoes is the least of his problems. Both men say that they sometimes work up to fifteen hours a day, torch cutting steel both inside and outside the ships without respirators. The device used for torch cutting mixes oxygen and gas to produce a flame that reaches 1500ºC. “When we’re cutting inside the ships, I frequently get dizzy and have to take many breaks to go outside and get fresh air. I often come home with a headache,” says Anwar. Former shipyard inspector Hasse Mortensen explains what happens to steel during torch cutting. Jane Frølund Thomsen is a senior consultant with the Department of Occupational and Environmental Medicine at Bispebjerg University Hospital. She explains that torch cutters have a higher risk of respiratory problems like chronic obstructive pulmonary disorder (COPD) and bronchitis because they are breathing in various particulates and gasses. Soruce: ILO’s “Safety and health in shipbreaking: Guidelines for Asian countries and Turkey”. Dr Frølund Thomsen went through the photo and video documentation Danwatch collected at Janata Steel and believes that its workers are also vulnerable to fire and to infection. “I can see from Danwatch’s videos that some of the workers are without shoes or wear only sandals. They are exposed to large and small risks of burns from torch cutting sparks. If they do sustain burns, they are also at risk of infection given their working environment, where they walk in soil, mud and other filth,” says Dr Frølund Thomsen. During one of its two visits to the Janata Steel shipyard, Danwatch met a worker whose injured hand was covered in a bloodstained bandage. “I cut my hand three days ago,” he says, and goes back to work. He is wearing sandals and shorts that do not even reach his knees. Bangladeshi law, the Hong Kong Convention and Maersk’s own policy regarding responsible shipbreaking all make clear that it is the shipyard’s obligation to ensure that all its workers are protected and that they use personal protective equipment. According to the Hong Kong Convention, shipbreaking facilities must guarantee access to and maintenance of necessary personal protective equipment and clothing. It is the shipbreaking facility that must ensure both that workers have the safety equipment they need, and that they actually use the equipment. Hasse Mortensen, the former shipyard inspector at the Danish Working Environment Authority, also looks through Danwatch’s videos and photos from Janata Steel. Mortensen watches in one video as four workers climb a rope ladder up the side of the Maersk Producer without safety harnesses or other fall protection, and then lift a gas canister after them with a rope. “I am looking at people that are in no way equipped for the job they are doing. Not the slightest consideration has been taken for their safety. This shipyard does not meet the standards of an acceptable workplace environment. Words fail me. It shows an atrocious lack of respect for the workers,” says the former workplace inspector. On the harbourfront in Copenhagen, Maersk’s director of sustainability, Annette Stube, explains that Maersk is not familiar with the shipyard where the Producer is now being scrapped. Danwatch presents her with its photo documentation from Janata Steel. “My immediate reaction to these pictures is that the shipyard does not comply with the Hong Kong Convention. As I said, we really, really regret that the ship ended up in Bangladesh,” Stube says. 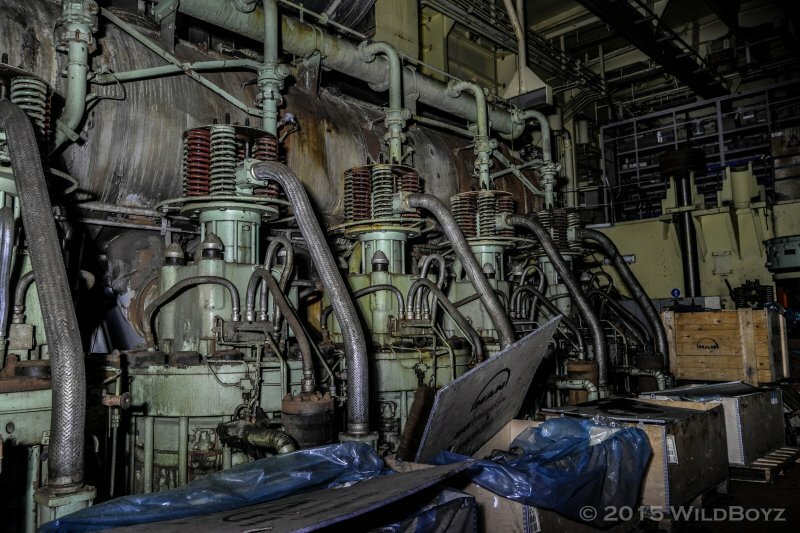 “It is very important to us that our ships are scrapped under proper conditions. 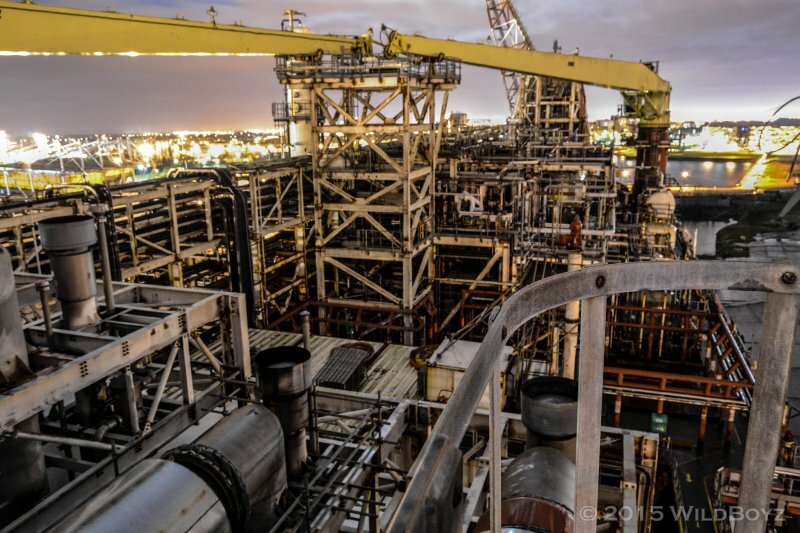 We make a big deal out of ensuring that the standards are in order where we scrap our ships. We still disapprove of shipbreaking in Bangladesh, but it is not our responsibility. It is the responsibility of the buyer who sent the ship to Bangladesh,” maintains Stube. Maersk has joined the United Nations’ Global Compact, ten principles for corporate social responsibility that encourage businesses to take precautions to prevent environmental impacts and to respect human rights. Maersk is not only a member of the Global Compact; it belongs to Global Compact LEAD, an exclusive group of sustainable businesses that serve as representatives of the Global Compact. In addition, Maersk maintains that the company’s policies are based on the United Nations’ Guiding Principles for Business and Human Rights. According to these guidelines, businesses are responsible for negative effects on human rights and the environment that can be linked to their actions and supply chains, even when a business has not committed such acts directly. Even though Maersk refuses to accept responsibility for the fact that the Producer is being dismantled at a shipyard that it finds objectionable, the company admits that it could have done a better job in crafting its contracts with buyers to ensure the ships are scrapped responsibly. Maersk was willing to provide evidence that Maersk required the responsible scrapping of the Producer. Over the next few months, workers at one of the world’s most dangerous shipyards in Bangladesh will break up a Maersk oil ship. The ship is being cut up by workers in bare feet under life-threatening conditions, while Maersk renounces responsibility. “That is a difficult ship to cut,” says an older worker, pointing to the newly-arrived ship Producer, which is grounded about 300 metres from the edge of the beach. On the deck of the 236 metre-long red ship is both a helicopter landing pad and a large crane. Aside from these, from the distance the ship looks similar to the other giant ships stranded at beach by the Janata Steel shipyard in Chittagong, Bangladesh. The difficult ship that the worker is trying to describe is the Producer, a decommissioned oil platform that until spring 2016 was called the North Sea Producer, owned by Maersk and the international firm Odebrecht. Earlier in the year, the Producer was declared a “dead vessel” after 32 years of service in the North Sea. Last summer, it was towed from northern England to Chittagong in the Bay of Bengal. This followed the sale of the ship by Maersk and Odebrecht. In August the Janata Steel shipbreaking yard bought the ship from the world’s largest cash-buyer of ships for recykling, GMS, according to VesselsValue, an agency which provides shipping data. 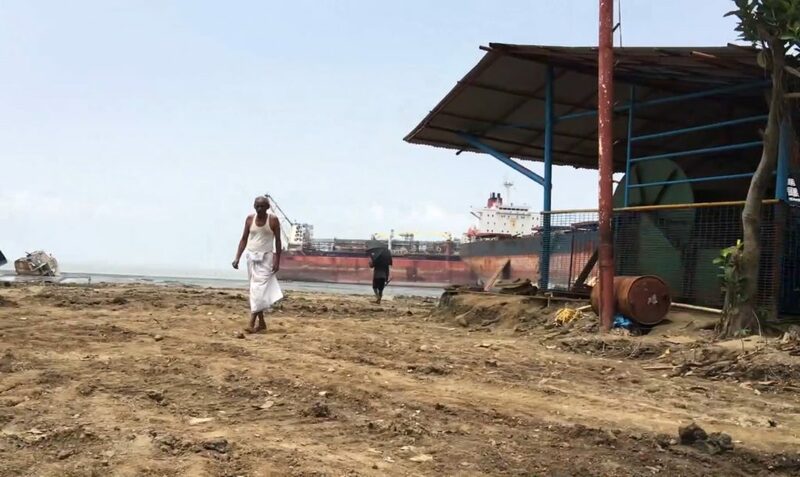 The older ship worker who welcomed Danwatch on the shipyard’s beach estimates that he and his colleagues will begin the shipbreaking of the Producer in a few weeks. At first glance, he doesn’t look much like a shipyard worker in his sandals and sleeveless t-shirt. But he is, and a seasoned one at that, with fifteen years of experience – the last six of them at Janata Steel. Two days after we find the Producer on the beach at Chittagong, Maersk writes an email to Danwatch. The company is aware that Danwatch is investigating the shipbreaking industry in South Asia. Whether the company knows Danwatch is Chittagong remains unknown. Maersk has received bad news, the email says. 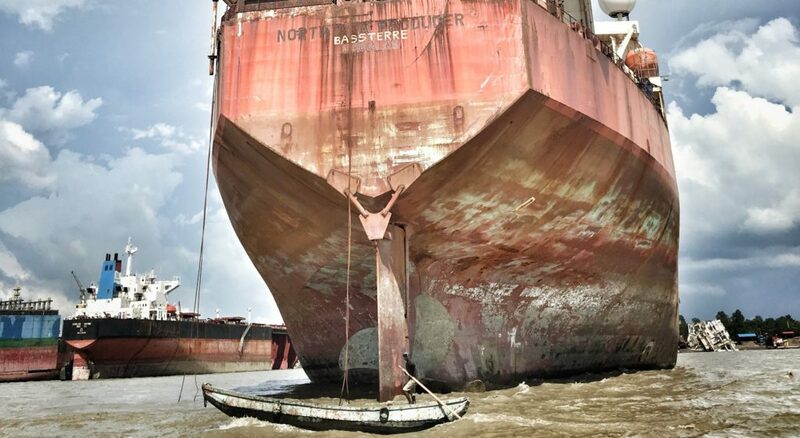 For many years, Maersk has distanced itself from the widely-criticised beaching method, in which a ship is sailed at full speed onto the beach so that it can be dismantled directly in the intertidal zone and which is used in Bangladesh. 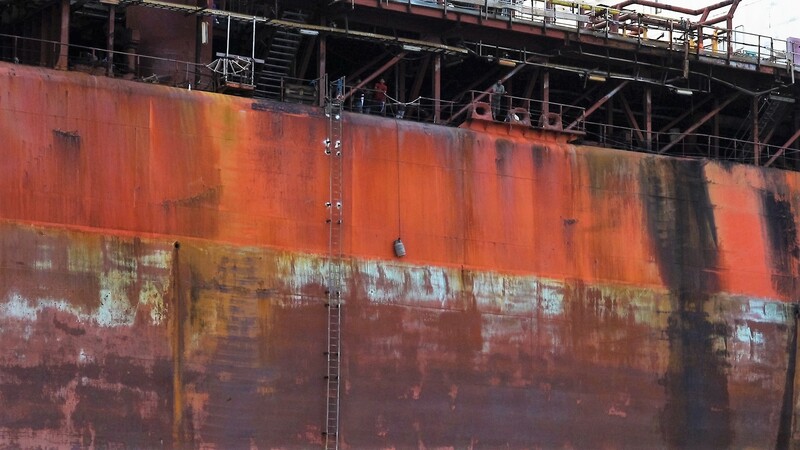 In so doing, toxic paint is scraped off the bottom of the ship and released into the water and sand, while chemicals from the ship flow freely with the tide out into the sea. Maersk regrets that the Producer now lies on a beach in Chittagong, says Annette Stube, director of sustainability for Maersk, when we meet her some weeks later at Maersk’s headquarters in Copenhagen. The company has not made adequate demands regarding the responsible scrapping of the Producer, she recognizes. The disparity between conditions in Chittagong and the lofty workplace safety standard to which Stube refers is easy to spot at the Janata Steel shipyard. It’s a long way from the numerous workers Danwatch met who had neither shoes, helmet nor masks to Maersk’s slogan “We live safety,” the meaning of which is expounded on the company’s website. In Oslo, Sigurd Enge, who is responsible for shipping, oil and the Arctic at the Norwegian environmental organisation Bellona, says that a floating oil platform is like an industrial plant. 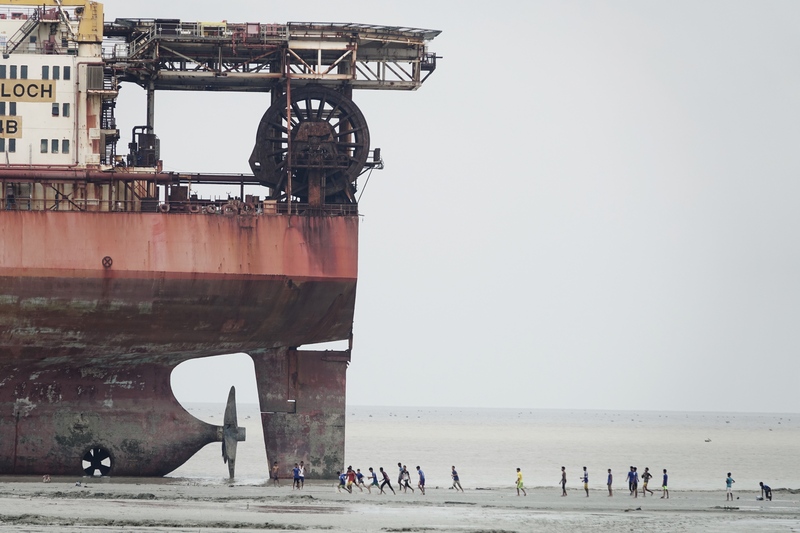 “A beach in Bangladesh is really the last place a floating oil platform should be scrapped. The shipyards in Chittagong are not at all equipped to perform responsible shipbreaking when it comes to safety and the management of hazardous waste,” says Enge. 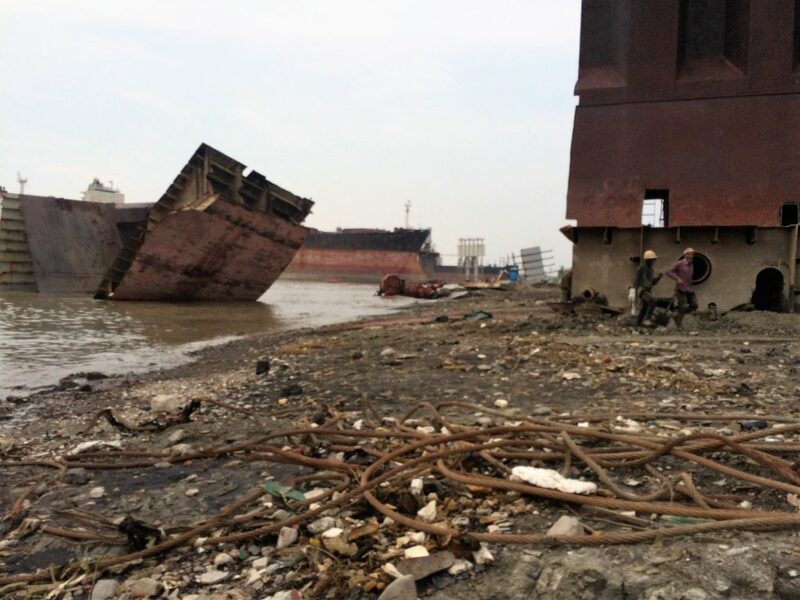 There are neither local nor national systems in place in Bangladesh to dispose of hazardous waste, according to both the Bangladeshi government and the Bangladesh Shipbreakers Association, the domestic trade association for shipyard owners. Danwatch made repeated attempts, without success, to contact Aman Uddin, the owner of Janata Steel. 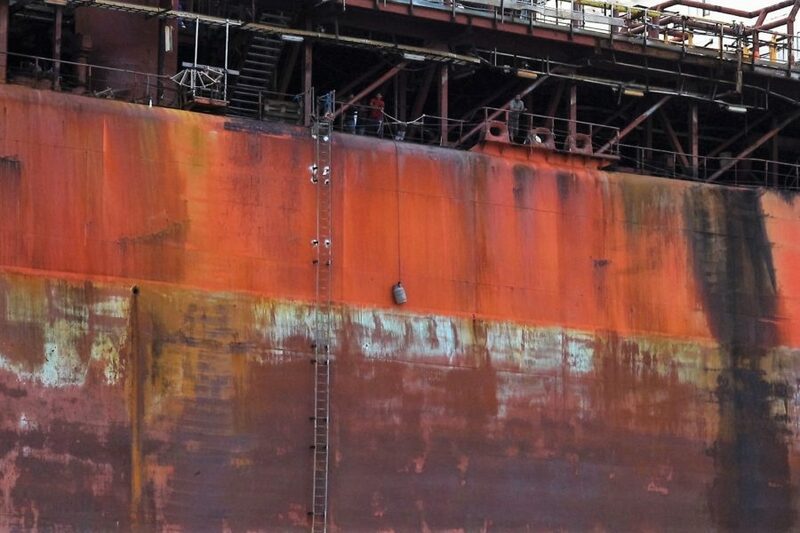 Danwatch hoped to ask what plan and security procedures the shipyard has with respect to the scrapping of a floating oil platform and the disposal of hazardous waste. We also wanted to ask how workers would be protected during the shipbreaking of the Producer. Furthermore, Danwatch asked GMS, which sold the ship to Janata Steel for scrap, how the Producer was cleared of dangerous chemicals, oil and gasses, as well as of any radioactive material before the ship was sold for scrap and sailed to Bangladesh. GMS declined to respond to Danwatch’s question on the telephone. Neither did GMS respond to Danwatch’s written questions before this investigation was published. At Janata Steel, shipbreaking is accomplished manually, with torch cutters. Oxygen and gas are pumped through a device that creates a 1500ºC flame that can cut through steel. Because torch cutting emits a number of harmful substances, the law in Denmark requires that workers complete a specialised training programme before they can be certified. Bangladeshi law also requires some kind of training for torch cutters. Ali Hassan and Abdullah Anwar are torch cutters at Janata Steel. They tell Danwatch on their lunch break that they have never received instruction in torch cutting, nor have they had any kind of safety training. They began as assistants and over the years were groomed to become torch cutters. Both have been with Janata Steel for six years, and will soon begin cutting Maersk’s oil ship into small pieces to be sold for recycling on the Bangladeshi steel market. If the shipbreaking of the Producer were carried out according to the prescriptions of Maersk’s standard, torch cutters working in confined spaces would be wearing respirators to protect them from poisonous gasses and particulates. Their lunch break over, Anwar and Hassan return to the shipyard. One of them wears rubber boots and the other is barefoot as they enter an area where metal plates, ship screws, wires and gas lines tangle in the mud. Several of their colleagues follow suit. Some wear sandals, others have helmets. Only a few wear coveralls. The work uniform seems haphazard, with the exception of the scarves that nearly everyone wears around their necks. One of Hassan’s colleagues, Mohammad Chandra, confirms that Janata Steel does not provide its workers with necessary protective equipment. “We have to buy safety glasses and coveralls from the shipyard if we want them. We aren’t given them. There’s not water at the shipyard either, we have to bring our own from home. If we ask for water or food, we’ll get a reprimand,” says Chandra. Danwatch wanted to ask Janata Steel how it protects its workers from harm, and whether it is true that workers have to buy their own safety equipment. As noted earlier, it was not possible for Danwatch to get in touch with Janata Steel. Danwatch spoke at the shipyard and in workers’ homes with torch cutters and with carriers, whose job it is to remove and carry inventory out of the ships. They live in wood and sheet metal shacks right next to the walls of the shipyard. Three to four workers share a house four square metres in size, where they sleep on reed mats on the floor. The workers have a hard time describing in detail what is in the ships they are cutting up with their bare hands. They know that the smoke is dangerous, but don’t know what it contains. They can tell that it does something to their bodies, though. “Cough, headache and breathing problems,” say several of the workers. Only one of the fourteen workers Danwatch spoke with knew what asbestos was. “Yes, yes, asbestos – it floats in the air when we remove the inventory from the ships,” says Abdul Mondal, one of the carriers. Mondal has not received training either, whether in safety or the health risks related to his work. According to Maersk’s standards, a shipbreaking yard must have a programme to ensure the safe handling of toxic materials like asbestos, heavy metals and paint. In addition, workers must go through safety training, be informed about relevant health risks, and receive a health exam. The workers Danwatch spoke to report that they have never received information or training about the dangerous gasses and heavy metals they work with on a daily basis, or about what these things can do to their bodies. For seven years, senior consultant Tapan Kumar Nath from Chittagong College Hospital has organised a mobile clinic for the shipyard workers in Chittagong. Dr Nath points out that the life expectancy of a shipyard worker in Chittagong is about 50 years – 21 years less than the normal life expectancy for men in Bangladesh, which population data from the United Nations and the CIA Factbook put at 71. Dr Nath says that the most common health issues that he observes among shipyard workers are respiratory problems and low lung capacity. At the shipyard, a worker says that things are busy at Janata Steel, as his colleagues all around him use torch cutters on the large metal plates that lie in stacks everywhere. Three boys play a few metres away at the water’s edge, climbing up on one of the great propellers that lie half-buried in the sand around the yard. “Sometimes we get this close to the ships,” says one of the boys, stretching out his arms to show the distance with his hands. A metre, give or take. The boys’ provocative glances and shy giggles reveal that they know very well they’re doing something they are not aloud to. But they have unfettered access to the shipyard, and no one stops them. In Copenhagen’s Sydhavn neighbourhood, Danwatch meets professor Peter Hasle, a leading expert in occupational environment with the Centre for Industrial Production at Aalborg University’s Copenhagen campus. Prior to our meeting, Hasle has had a chance to read Maersk’s standards for responsible shipbreaking, and to compare them to the Hong Kong Convention and to Danwatch’s photo and video material that includes images of Hassan and Anwar at Janata Steel. “It looks like the workers at the shipyard have walked straight in off the street. They are wearing ordinary, everyday clothing, have no helmets on, and children run around on the work site. It is a completely basic rule that unauthorised persons may not walk around a shipyard,” says Hasle. He does not see anything that suggests that Janata Steel could be in compliance with the standards of either Maersk or the Hong Kong Convention. “It definitely does not seem like there is a management there that is capable of instructing workers how to do their jobs in a safe way. Nor does it seem like there’s any desire to do so, when the conditions are as terrible as they are,” says the occupational environment expert. Still, torch cutters Ali Hassan and his colleague Abdullah Anwar are happy that the Producer has arrived. They prefer Janata Steel to other shipyards they’ve worked at in the past. Not because the conditions are so different, or because the pay is better, but because there’s always work. Steady work is a luxury in Bangladesh, even when the pay is too little to live on, and the job could cost you your life. “There are always new ships at Janata, and that’s good because there’s no long stretches without work and pay,” says Anwar. He says that he earns about $8 per day. His monthly salary varies from month to month, since he gets no pay for sick days or days off. The legal minimum wage in Bangladesh is about $19 per month. The minimum wage for shipyard workers is significantly higher, however: about $76 per month, based on 26 workdays. Hassan, Anwar and Chandra all come from northern Bangladesh, where job opportunities are few and poverty is even more prevalent than in the rest of the country, which is one of the poorest and most densely populated in the world. 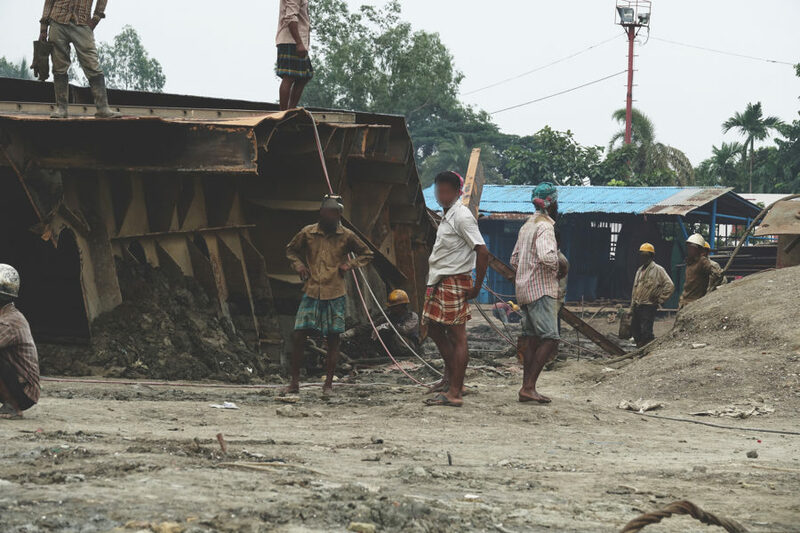 Every year, thousands of men migrate to Chittagong to work in the shipbreaking industry, many of them leaving their families behind in the villages. “A bus ticket home costs about 1600 taka ($20, ed.). I can afford to visit my family two or three times a year,” says Hassan, who left his wife and three sons behind in Jamalpur. Hassan earns barely $6 per day with overtime. Yesterday he worked 15 hours, he says, and he must support a total of six people on his income. Twenty-six-year-old Mohammad Chandra has worked at Janata Steel since he was 16, he says. And yet neither Hassan, Anwar nor Chandra has ever seen or signed a contract that describes their work, pay and rights. None of the fourteen workers from Janata Steel that Danwatch spoke with could show us a contract with the shipyard. Nor could they show us pay slips. The workers report that they sign a paper when they receive their pay, but they don’t receive a proper pay slip. Sick pay, vacation pay and bonuses are unknown to the workers Danwatch spoke to. Bangladesh has a population of just over 156 million, of which 31.5% live in poverty, according to numbers from 2010. Unemployment in 2014 was estimated at 4.5%. Chandra says that employment at Janata Steel is governed by the “no work, no pay” principle. For this reason, he forces himself to go to work even when he is not feeling well. “When I’m torch cutting, I feel dizzy, and I get really bad headaches. But I have to work as many days as I can, overtime too. Otherwise I don’t earn enough,” says Chandra. Chandra and most of his colleagues take a half-day off on Fridays. He earns barely $6 a day for a 12-hour shift. He explains that the job is so hard that some months, he can only work 25 days because he is so exhausted he cannot continue. A 2015 Bangladeshi labour law set the minimum wage at about $19 per month. The minimum wage for shipyard workers, however, is about $76 per month without overtime payment, based on 26 workdays. According to Maersk’s guidelines, which are based in part on guidelines from the International Labour Organisation, the shipyard must ensure that all workers have an adequate contract and receive fair compensation with respect to local prevailing wages. Furthermore, work may not exceed 48 hours per week. Overtime must be both voluntary and paid at a higher rate. At the Bangladesh Trade Union Centre’s local office in Chittagong, Dilip Kumar Mah works to unionise shipyard workers. His organisation, together with other trade unions and advocacy groups, gives shipyard workers both safety training and knowledge about their rights and the health risks associated with their work. Beaching of ships in Bangladesh started in earnest in the 1980s, propelled by the demand for recycled steel. In 2015, 194 ships were broken in Bangladesh, where there are about eighty active shipbreaking yards. Recycling the metal and steel from the ships reduces the need to import steel. Based on data from 2005-2008, Bangladesh uses approximately 500,000 tonnes of metal and steel annually, more than half of which is provided by the shipbreaking industry. “It’s an uphill battle,” says Mah of his work. Mah confirms that the low pay is a widespread problem, and that shipyard workers do not receive the two yearly bonuses that are required according to a 2015 Bangladeshi labour law. Another problem is that workers must buy their own protective equipment. “The workers can’t afford it, that’s why they are torch cutting without masks,” says Mah. He explains that the workers don’t understand the serious health risks that can result from torch cutting, asbestos and hazardous chemicals if they are not wearing the necessary safety equipment. “According to national law and international regulations, the shipyards must give their workers safety training and teach them how to protect themselves from the hazardous waste they are handling. But it’s easy for the shipyards to replace workers. If any of them are unhappy with the conditions, there are hundreds of other impoverished workers ready to take the job. That’s why the shipyard owners have no interest in investing in worker safety,” explains Mah. 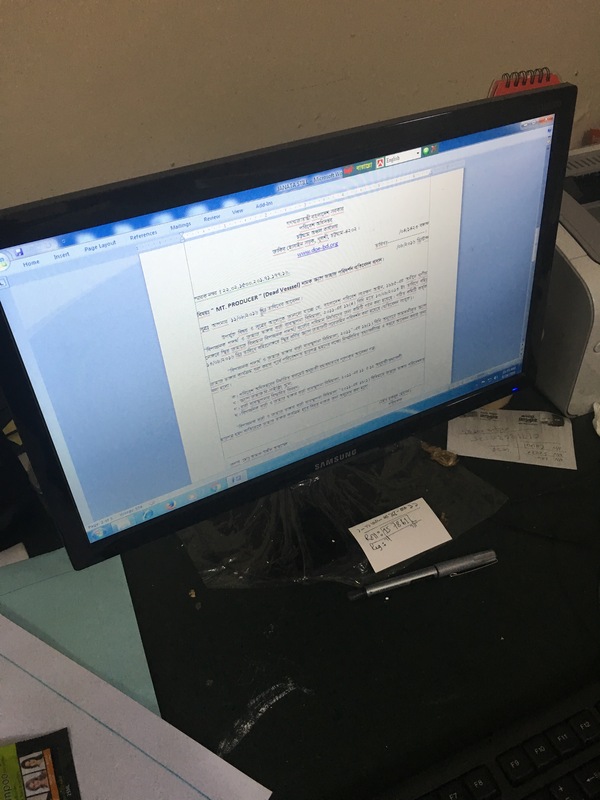 At the Chittagong office of the Department of Inspection for Factories and Establishments, Danwatch meets a senior official who does not wish to be quoted by name. Once he is promised anonymity, he is eager to talk about the serious safety problems the inspectors observe at the shipyards. “The shipyards are so dangerous, and the ships so unsafe, that my inspectors don’t dare to go into the hull of a decommissioned ship to inspect the torch cutting. The workers climb many metres up to the ships without fall protection, something my inspectors wouldn’t dare do. It’s no secret that the shipyard employees work every day without the necessary equipment that could protect them from the dangerous accidents we see in the industry,” says the official in his office. He explains that his department simply lacks the economic and human resources to inspect all the shipyards and ensure better conditions. The workers at Janata Steel don’t have the luxury of being afraid of heights. On one of the last days of August, Danwatch sails out to get a closer look at Maersk’s oil ship, the Producer. Its rusted hull sways slightly in the afternoon high tide. At close range, the oil ship stands out from the other ships. A complicated labyrinth of pipes fills the entire deck. Five men climb approximately 20 metres up a rope ladder on the side of the ship. They climb in rhythm, keeping an eye on each other as they attempt to reach the top. They wear neither safety harness nor fall protection, and when they reach the deck, they begin to pull a gas canister up behind them on a rope. The shipbreaking has begun, and Ali Hassan, Abdullah Anwar, and Mohammad Chandra will soon be aboard the Producer. With their torch cutters in their hands, scarves over their mouths, and nothing on their feet, they will cut, tear and chop the ship into unrecognisable steel. 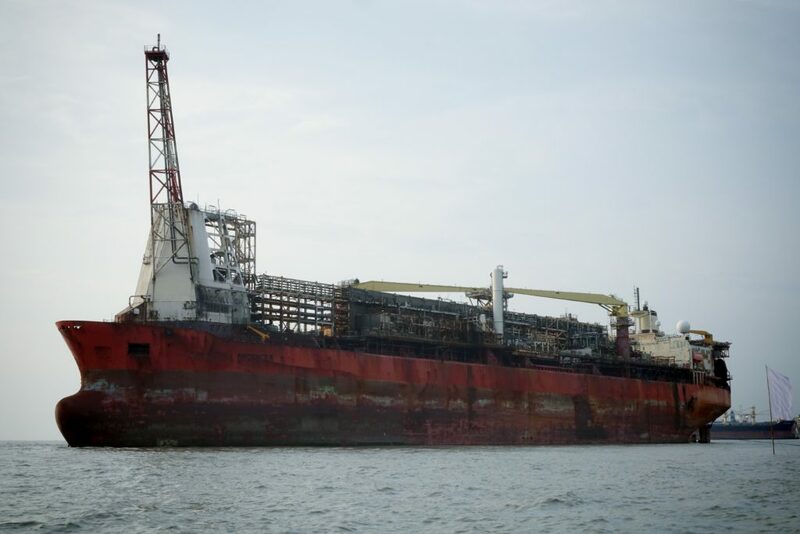 The Danwatch team discovered early in its investigation that the decommissioned oil platform Producer, half-owned by Maersk, was at that very moment preparing to be scrapped in Chittagong, Bangladesh. Therefore, in August 2016, Danwatch travelled to Bangladesh and found the Janata Steel shipyard, where Producer was beached. Danwatch’s team was in Chittagong for nine days. Three were spent visiting Janata Steel, interviewing shipyard workers and documenting the facilities. Another few days were spent speaking with local authorities and interested groups.